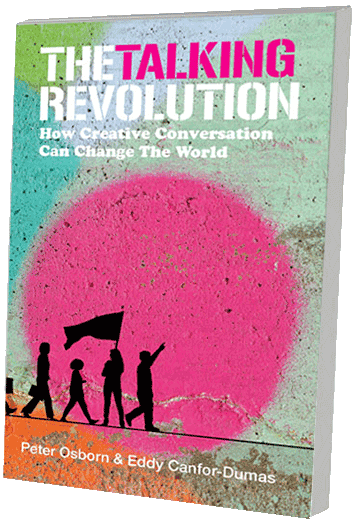 Talking revolutionaries are people who decide to revolutionise any relationship – at home, at work, or in the wider world – by harnessing the skills and insights of Creative Conversation and putting them into action. There are many ways to do this . . .
Maybe start with someone you know and would like to communicate with more freely. Begin with the simple intention to create ‘something of value’, e.g. a better connection, deeper understanding, some hope, more trust. If Creative Conversation helps you, pass it on. Point them to this website, buy them a book. Just as there are debating clubs and book clubs, you could get a group of friends together and talk about any topic using the principles of Creative Conversation. Embed some positive habits while exploring potentially contentious or divisive issues. Talk in new ways, and create something of real value together.